Words that lift up your soul. Biblical wisdom worth more than the gold it is written in. Two millennia ago we were blessed with the greatest religious gift Christian believers have ever known. The arrival of Jesus and his teachings caused quite a stir in olden times and the impact they’ve had on much of humanity continues to make ripples in the present day. One of the things he spoke of most fervently, extending our love and kindness to everyone high and low, was to become the cornerstone of how we should view not only those closest to us, but God himself. It is that faultless, divine love that is the driving force which can move mountains or inspire a tiny act of compassion. Most importantly, it gives us the strength to face the day, to reach out for meaning and grasp it firmly. Faith in the Lord and, by extension, in ourselves helps us persevere on the journey into a brighter hereafter, and a well thought-out Christian gift can strengthen that faith even more. 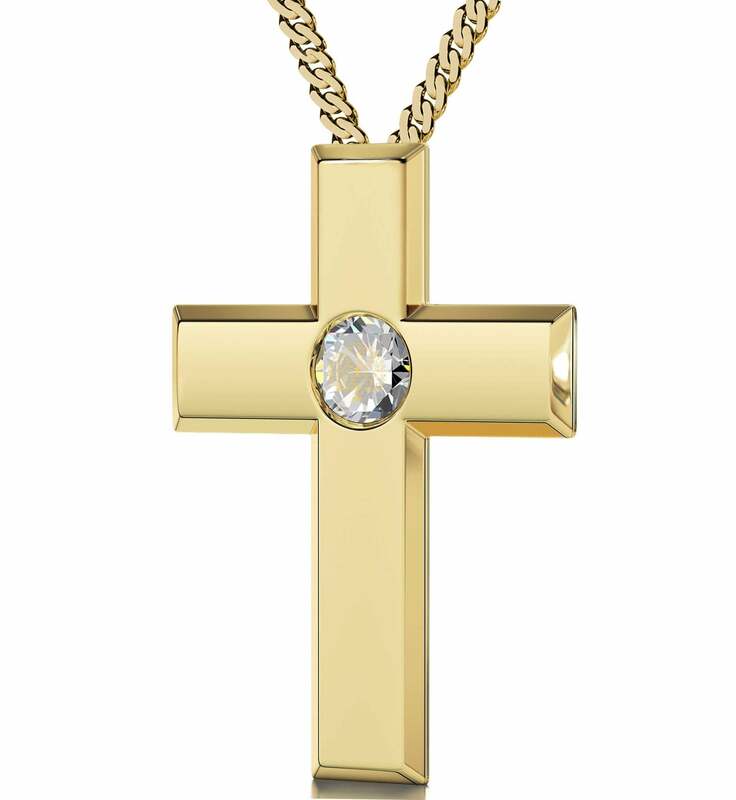 This is where our carefully chosen Christian necklaces for both men and women come in. 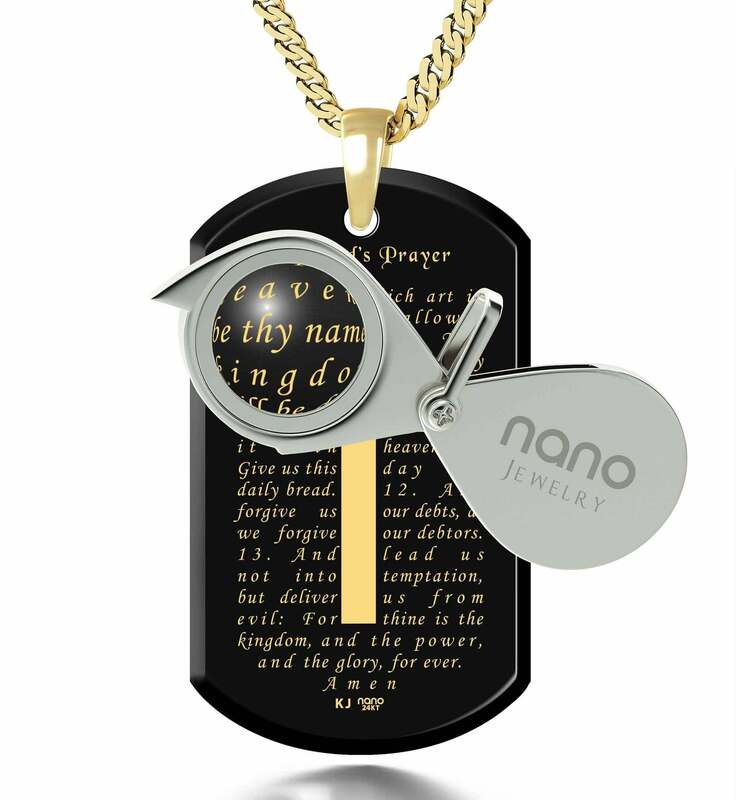 Unlike so many Christian gift items that have lost the meaning of their message (and possibly a better part of their tastefulness) somewhere along the way, these religious pendants are fitting depictions of some of the most powerful words of wisdom and images contained within the Bible. Even though there are many more passages in the Bible that Christians love to come back to, nothing evokes the spirit of the faith in a more concise way than the Lord’s Prayer. 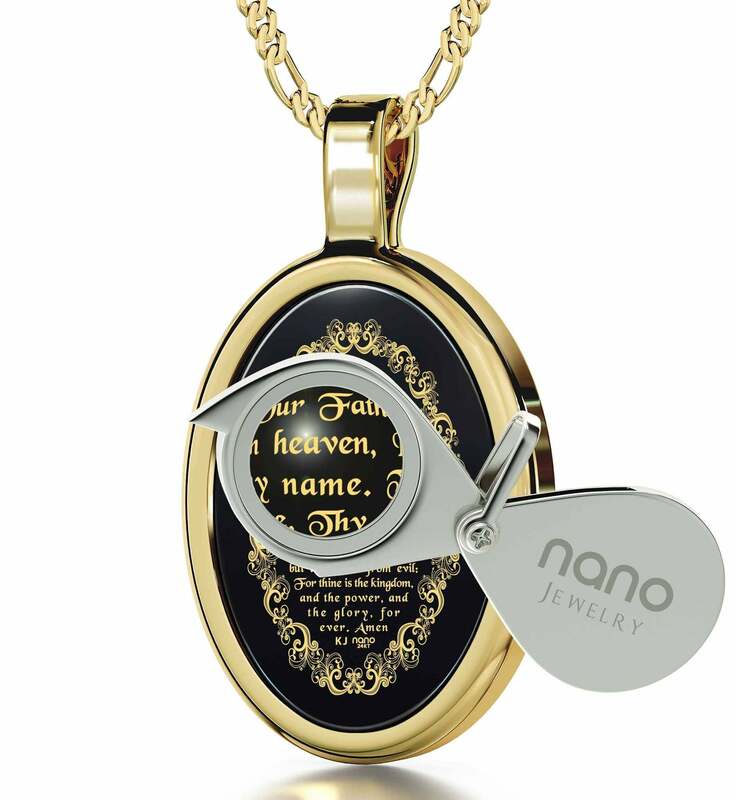 Short enough for anyone to recite by heart, but as meaningful as any of Jesus’ other teachings, if not more so, the prayer finds its place on many necklaces in this collection. Whether you find the usual look of a small gold cross necklace to be the most appealing, or feel that a bolder, more lavish design befits the words to the Lord’s prayer more, it shouldn’t take long for you to find a tasteful option that any devout woman will find beautiful. As there are multiple translations of the Bible, many versions of the prayer are yours to give. 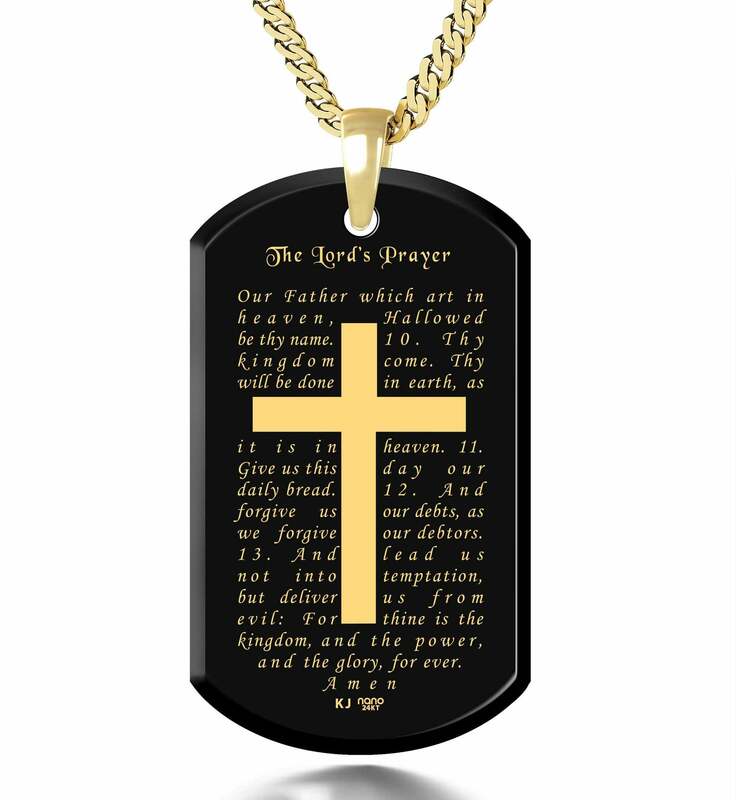 The Lord’s Prayer King James version is the most prominent with regards to the number of styles on offer, but there are also traditional and modern versions, along with its translation into multiple languages. 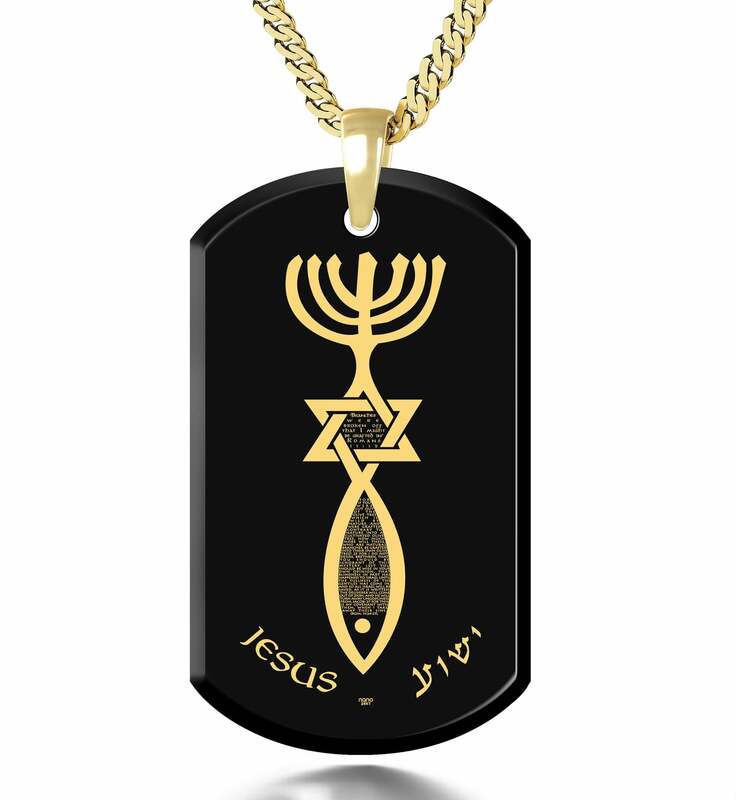 There’s the Lord’s Prayer in Hebrew, Greek and Aramaic just to name a few, so there’s really something on offer for everyone. The 23rd psalm is another well-known passage which inspires confidence and gratitude. 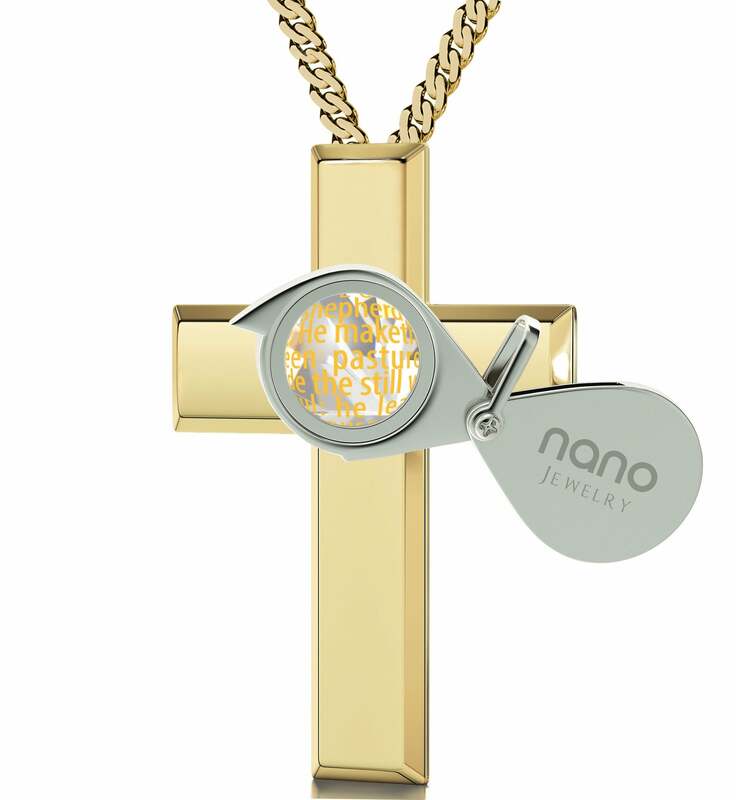 This lovely white gold piece of Christian jewelry for women carries the psalm at its heart along with a beautifully inscribed golden cross. Not a big fan of the round frame? 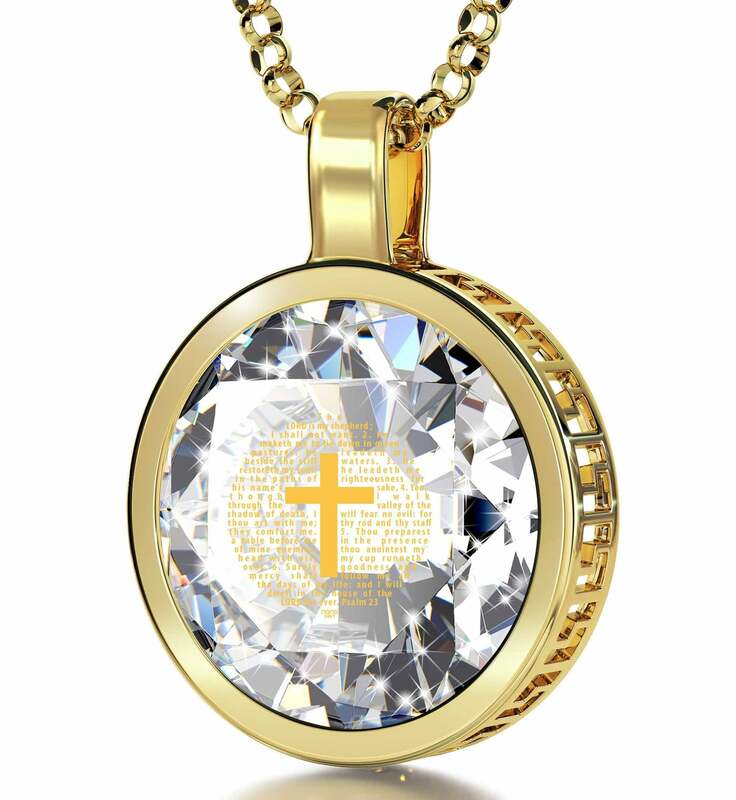 How about one where the Lord is my shepherd prayer adorns a glimmering Swarovski stone set inside a frame of gold studded with diamonds? Psalm 23 can also be gifted in various world languages. French, German and Spanish all have expertly-translated versions of their own, so picking out the gift for Christian women that speaks to her in her own language won’t be a problem. There are a number of bold designs to choose from guys will love too. 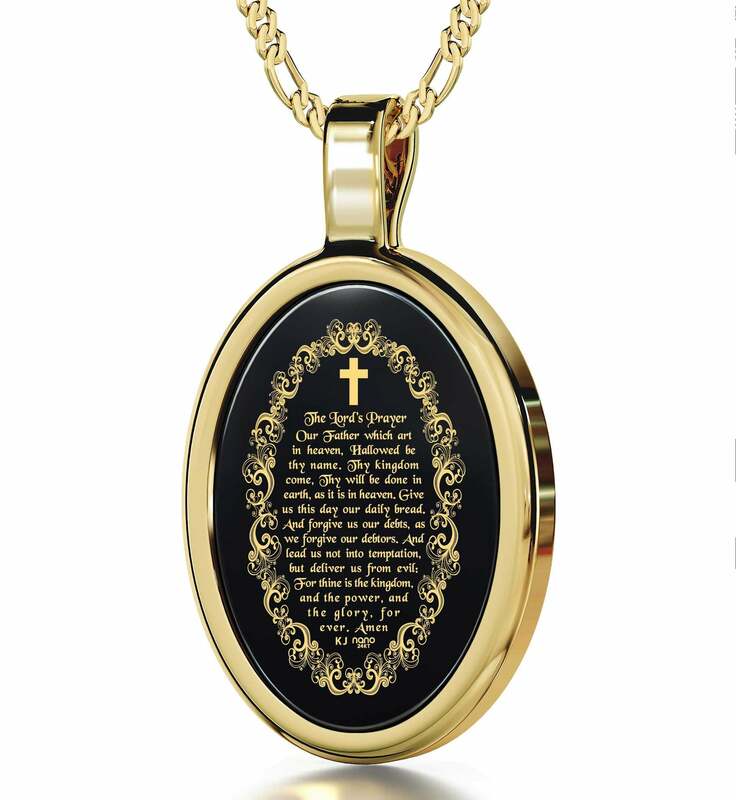 A necklace featuring a dark onyx stone inscribed with the Lord’s Prayer and framed with a decorative gilded “picture frame” is a perfect religious gift for men to both honor his beliefs and improve his style. 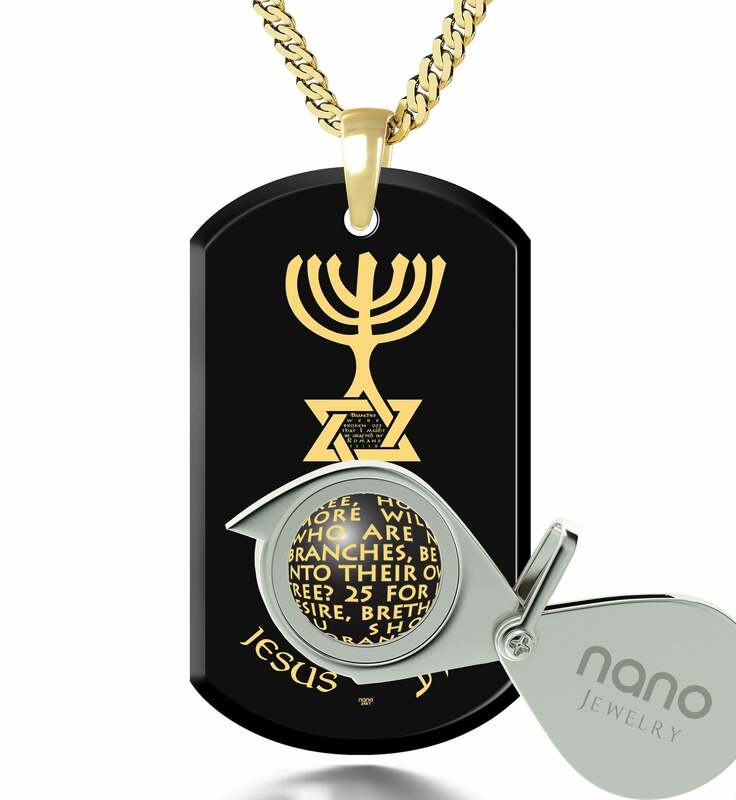 If that frame happens to be too much, there’s also a more austere version of the necklace resembling Christian dog tags where there’s nothing on the tablet that would draw attention away from its message. 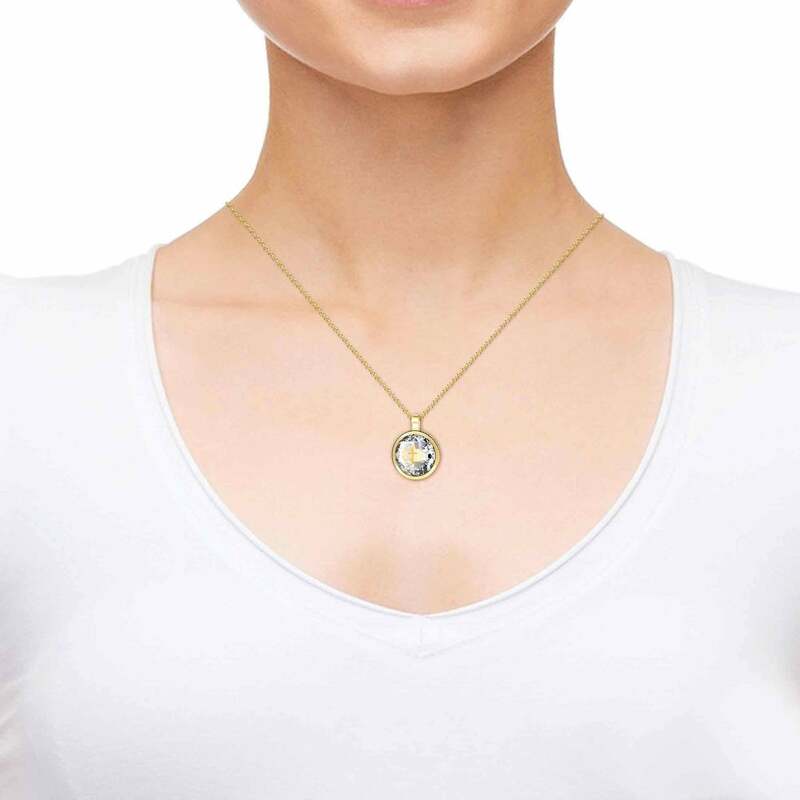 The prayer for peace necklace is among our most artistic creations and is certainly inspired by one of the noblest causes a believer can support. Nowhere is the city as gold or as breathtaking as in its inscription. The rooftops, parapets and buildings pictured in it are only matched with the hopeful words of the 122nd psalm written above them, and will remind them to wish for a lasting piece in its real streets whenever they ask the Lord for guidance. From not so traditional silver and gold cross necklaces for women to less conventional dog tag designs for men, there’s a style that will go perfectly with anyone’s looks and convictions. 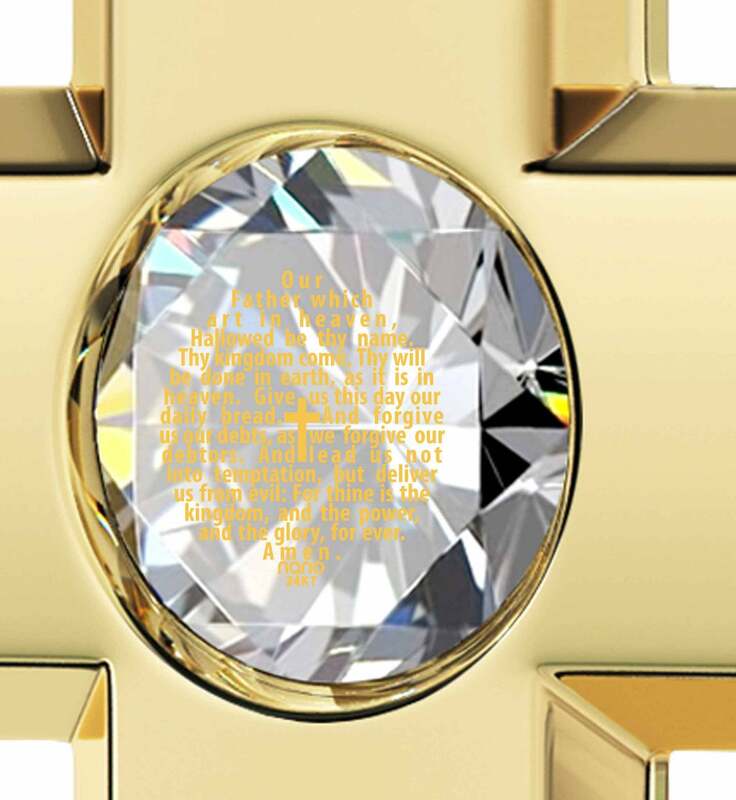 No matter which message of hope it is infused with, all of the words and images that grace the true faith jewelry have been crafted with joy only from pure 24 karat gold. Their imprint will continue to bring solace for more than a lifetime as, like firm beliefs, their golden lines can’t be broken. 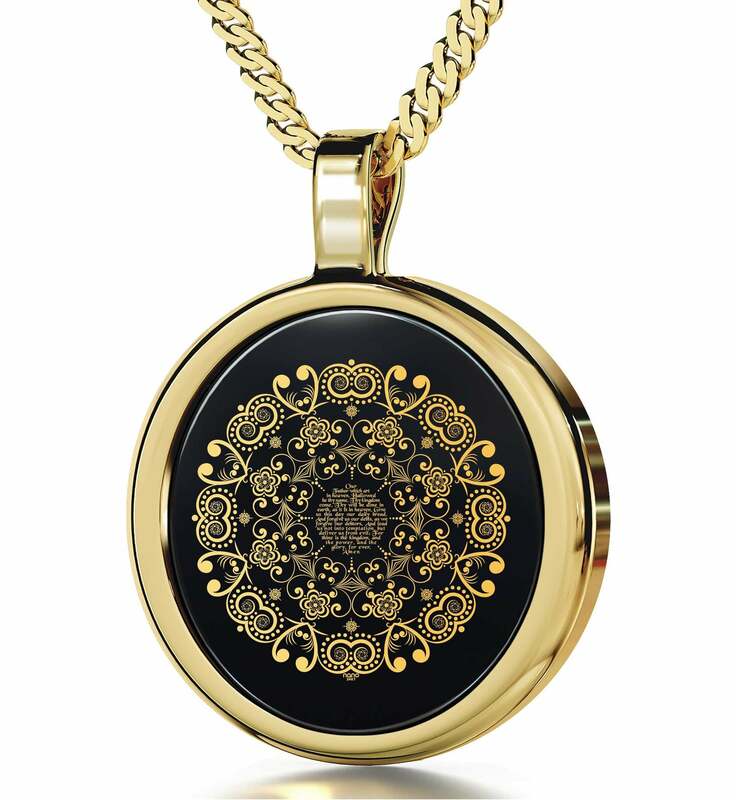 Their intricacy can’t be copied either, making each a unique necklace in its own right. 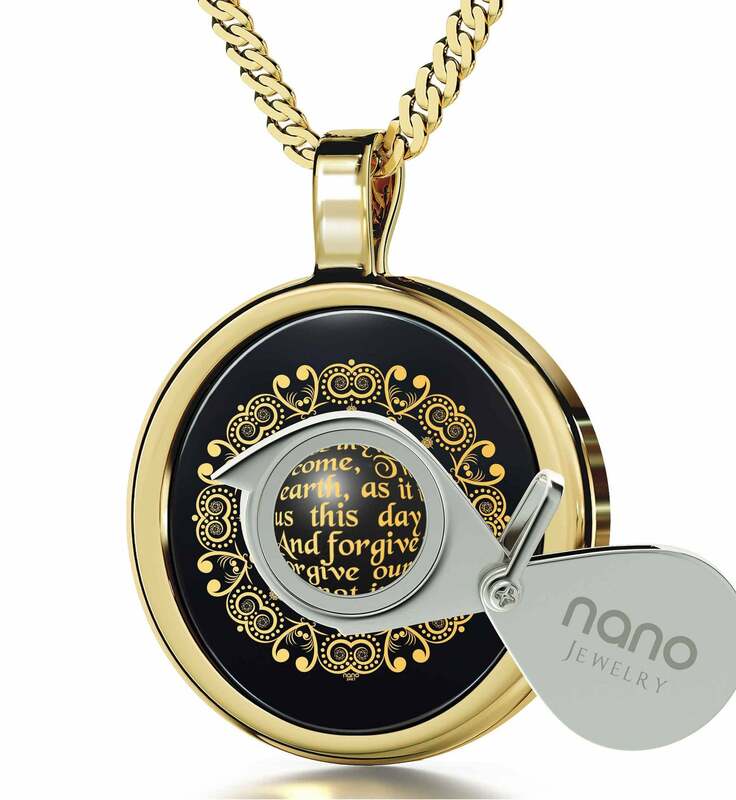 To ensure your loved one in benefiting the most from the meaning of their golden inscriptions, each small necklace comes with a magnifying glass custom-made to accompany it. 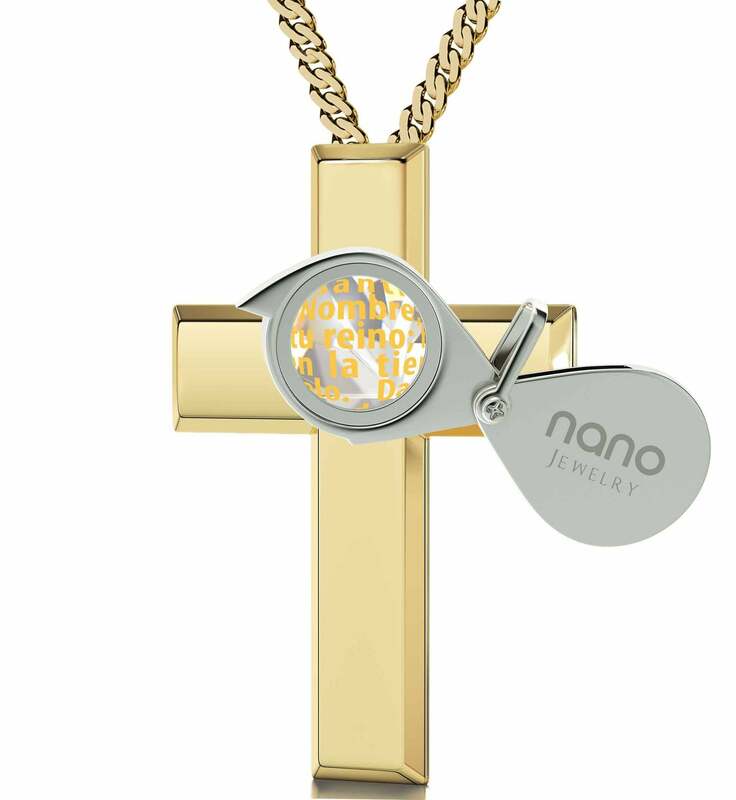 Together with a nice box the two items come in, it is a small sign of our gratitude that puts those extra few finishing touches to the entire experience which let them know that the Christian gift idea you’ve selected for them was really chosen with care. 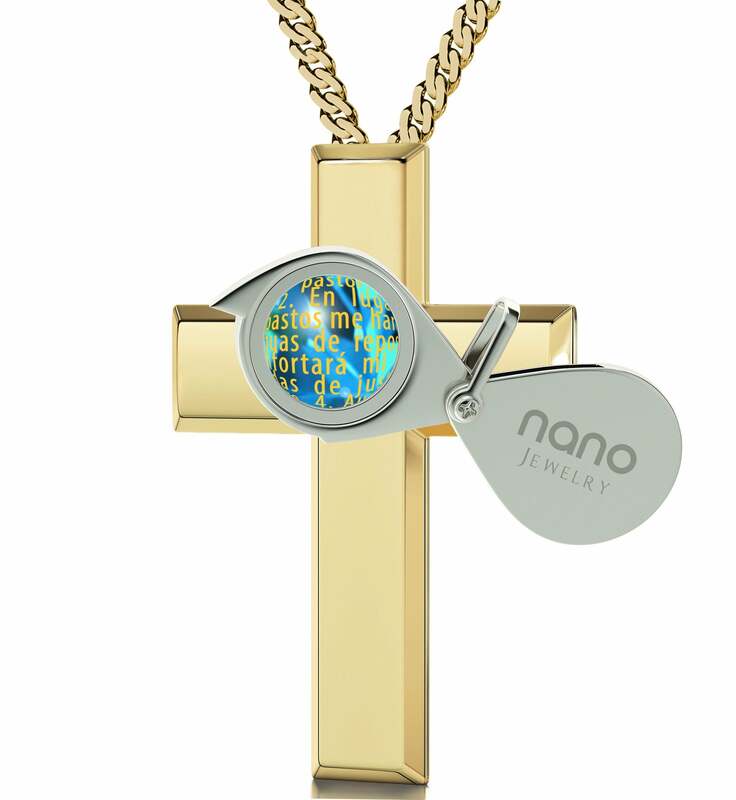 This is the kind of inspirational jewelry for women and men which deepens friendships, commemorates important events in the religious lives of those we cherish, and that says much not only about their convictions, but of the love and respect we can all show them whether we share these conviction or not, which in itself is quite a Christian thing to do.